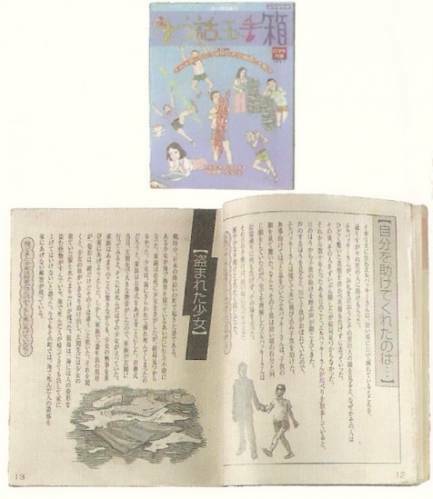 A supplement to the study magazine "Super Learning", a publication by Super Scientific Research co., publishers of occult magazine Atlantis, aimed at school-age children. As seen in the title, it is a "literature anthology special" compiling 100 strange tales from around the world. As visible in the image above, the tale of the "Stolen Girl" on the left-hand page can be read in the archive text. The story itself is clearly themed around "sin from the sea": "A creature that can steal human forms (Otoshigo) lives in the sea ... If those who die at sea (Simulacra) return, they must never be allowed to enter the house," an almost exact copy of the legend told on Yamijima. What should also be taken note of is the story on the right page, "I Was Saved By...". Though it can't be read in the archive's descriptive text, a summary of the story is: "A boy is saved from drowning in a river by a stranger. When he becomes an adult, he finds a boy drowning in a river. Upon saving him, the boy turns out to be him as a child..." In short, it is a story about a person meeting their self from the past. This setup is just like the scene in the level "Shu Mikami -2:25:10", in which he encounters his younger self clinging to the corpse of his father, Ryuhei. The Siren 2 staff used the "story" to give you the knowledge needed to decipher the game's story. There is also a story that was not actually created, but given a title, called "The Story of a Huge Explosion in the Toilet". This is clearly a hint at the incident involving Soji Abe tied to the destruction of the pylon near the end of the story. A map showing the location of a time capsule buried by the final graduating students in the schoolyard of Yamijima Elementary and Middle School, drawn in pencil on a piece of paper. From the Yamigame statue, symbolic of the school, "go three paces forward, five paces left, two paces right". As you can see by looking at the picture, in actuality the map used in the archives has no text written on it. This archive was created by compiling the text information with the photo later on. This is because, during the game's development, the characters' motion was modified repeatedly. Since if their movement changes so does the number of steps, this wasn't set for definite until the very final stages. Due to this, they made the archive by adding in the step numbers later. 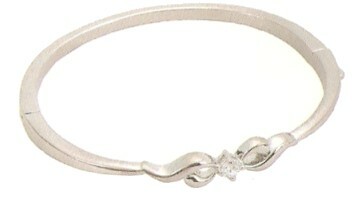 A bracelet with I.Y., the initials of Ichiko Yagura, engrave on the inner side. It is a pair with [No.074] Jade Bracelet, a bracelet set with a green glass bead with N.K. engraved on the inside (the initials of Noriko Kifune), showing that Ichiko and Noriko are friends. In [No.040] School Uniform-Shaped Letter, Ichiko tells Noriko that they will use their matching bracelets to come through exams. A video recorded by the security cameras set up across the Bright Win. The monitor flicks through a series of images from several areas such as the entrance and boarding corridor, showing Noriko Kifune, waiting by the stairs, meeting with Ichiro Nakajima. This, as noted in [No.045] Heart-Shaped Letter, is a recording of Noriko, weighted heavily by the pressures of her pregnancy, waiting to talk to her partner Ichiro Nakajima. Though only momentary, at the bottom of the stairs where Noriko and Nakajima are can be seen the whitish figure of a woman, which is the rampaging dove (Offshoot B') who attacks the ferry's passengers in the side story "Mystery of the Bright Win". Also, the security footage itself was influenced by Juon (directed by Takashi Shimizu), highly praised as a "masterpiece of J-horror". A video game console left aboard the Bright Win for entertainment purposes. 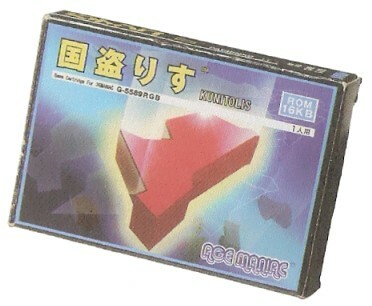 Released in 1982, it claims to be able to produce 3D graphics astounding for its time, but in reality Kunitoris, the game that can be played on it, is an active 2D game. I won't dare to touch upon the origin of its name.